Let me begin by saying that controlling mice with rodenticides is usually unnecessary and has a number of disadvantages. If at all possible, try to eliminate your mouse problem without using poisons. It's safer and longer-lasting. Poison baits designed to kill mice are often toxic in varying degrees to humans and other animals if those baits are ingested either primarily or secondarily (for example, if an owl eats a mouse or rat that was poisoned). Although the amount of rodenticide needed to kill a larger animal is usually many times more than that needed to kill a mouse -- the toxic effects of most rodenticides are dose-dependent depending upon the animal's weight -- many domestic pets and other non-target animals, and occasionally humans, are accidentally poisoned by rodenticides every year. Aside from the toxic risks associated with rodenticides, there is also the risk of poisoned mice dying inside wall voids or other inaccessible structural elements of a building. This can happen even when the poison is set outside the building, as it may take several days to as long as a week for mice to die after eating some poison baits. So whenever possible, try non-chemical mouse control methods first, and use poisons only when necessary. When are Mouse Poisons Necessary? Almost never. Practically any mouse problem can be cleared up by trapping and exclusion. But there are a few exceptions. When rodenticides are necessary, paraffinized bait blocks are usually a good choice. Mice are nibblers, so the bait block doesn't reduce bait acceptance all that much (if at all). The paraffin also helps keep the bait fresher for a longer period of time, and is less likely to be carried by mice to sensitive areas. 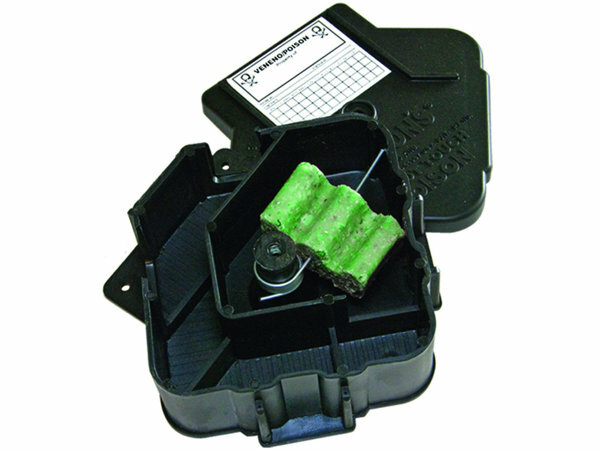 Paraffinized baits (and rodenticides in general) should always be used inside tamper-resistant bait stations, such as the JT Eaton 906TP Mouse Fortress Bait Station shown here. This is the same bait station used by most professional exterminators. The use of bait stations not only helps protect children and non-target animals from accidental ingestion, but also helps keep the bait fresh and clean and makes mice more likely to eat it. What you have to understand is that as important as finding food is to a mouse's survival, so is not becoming food. Mice are much more comfortable in enclosed places were cats and other predators can't follow. Using a bait station makes them more likely to eat an effective dose of rodenticide than if it's in an open tray in an exposed area where the mice feel vulnerable. In addition, mice are naturally inquisitive about mouse-sized openings. They're prey animals, so they're always happy to find holes that they can fit through, but predators can't. By using a bait station, you're making it more likely that they'll find the bait in the first place. The placement of bait stations is not that different from the placement of traps. The stations should be placed along mouse runways with the open ends in or along the mice's travel paths. Remember that mice don't see very well, so they tend to run along walls and other vertical surfaces. Bait stations also should be secured to a surface (usually a wall or floor) using screws, nails, glue, or heavy-duty double-sided tape. This is both for safety reasons -- taper-resistant bait stations aren't considered tamper-resistant unless they're secured -- and to prevent the stations from being moved by curious children (or adults) or by animals. In fact, whenever possible, bait stations should be placed in areas where only people authorized to check and maintain them even know they're there. Special care should be taken not to place rodenticide stations in areas in which mice may track rodenticide particles onto food, food handling surfaces, or other sensitive areas. For example, never place a bait station in a child's room, on a kitchen counter, or inside a cabinet where food is stored. As with any pesticide, always read, understand, and follow the label instructions. In summary, poisoning should be looked upon as only a last resort for controlling mice, and only a small part of an overall mouse control program. Sanitation, harborage reduction, and exclusion are the real keys to long-lasting protection against rodents. When using rodenticides, be sure to use them carefully, sensibly, and in full compliance with the label.